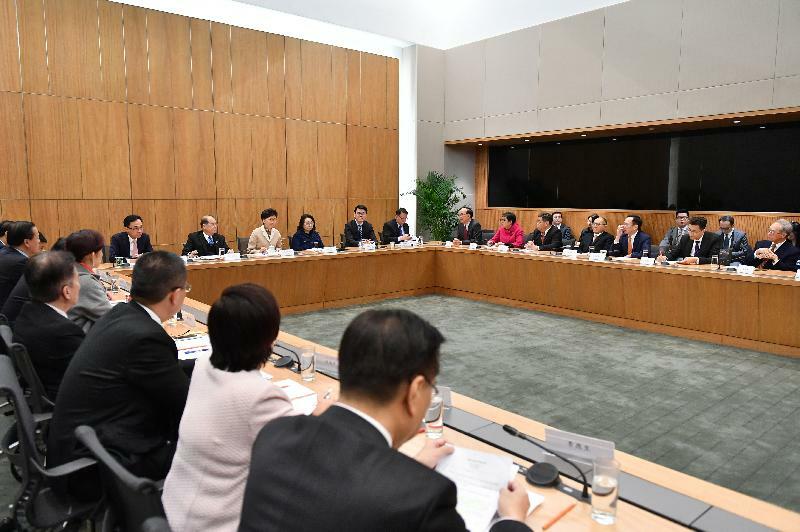 The Chief Executive, Mrs Carrie Lam, held an engagement session with about 30 Hong Kong deputies to the National People's Congress (NPC) today (February 12) to exchange views with them on Hong Kong's integration with the overall development of the nation and its active participation in the development of the Guangdong-Hong Kong-Macao Greater Bay Area. Some Secretaries of Departments and Directors of Bureaux also attended the session. Mrs Lam said the Hong Kong Special Administrative Region (HKSAR) Government will actively participate in three major national initiatives this year, namely the celebration activities of the 70th anniversary of the founding of the People's Republic of China, the second Belt and Road Forum for International Cooperation to be held in Beijing in April and the second China International Import Expo to be held in Shanghai in November. As the Outline Development Plan for the Guangdong-Hong Kong-Macao Greater Bay Area will be promulgated by the Central Authorities within days, Mrs Lam added that the participants are cordially invited to attend the related symposium to be jointly held by the governments of the HKSAR, Guangdong Province and the Macao Special Administrative Region on February 21 to contribute to the building of a world-class bay area. Mrs Lam said that the HKSAR Government attaches great importance to the views of the Hong Kong deputies to the NPC. Noting that they have been very concerned about Hong Kong and know a lot about its affairs, Mrs Lam said that they are the cornerstones of various sectors in the community who are tasked with the vital responsibility of taking part in national affairs. She expressed the hope that they would continue to support Hong Kong in leveraging its advantages to seize the opportunities arising from the development of the Guangdong-Hong Kong-Macao Greater Bay Area and the Belt and Road Initiative, thereby contributing to Hong Kong and the country. The Chief Executive will meet separately the Hong Kong members of the Chinese People's Political Consultative Conference this Thursday (February 14).